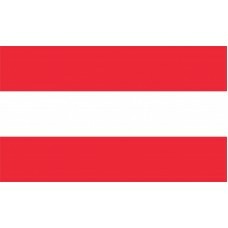 The Austrian flag features 3 horizontal bands of red, white, and red. 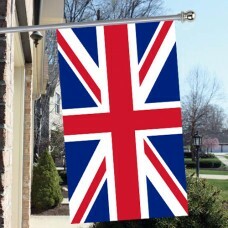 According to legend, it is thought that the flag was invented by Duke Leopold V of Austria. During the Siege of Acre, in 1191, when Duke Leopold V was in battle, his white coat was drenched with blood. When he proceeded to remove his belt, the clothes underneath remained clean and white, which is when the red-white-red theme was introduced. The red and white colors have been a national emblem of Austria for over 800 years and the colors have been included in some form on all the flags. 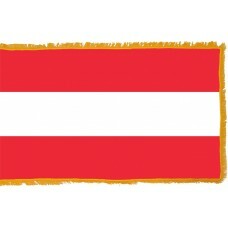 The Austrian flag is the 2nd oldest national flag, following Denmark. However, some people state that the Austrian flag is actually older than the Danish flag but despite being designed in 1191, it was not used until 1230. Austria is a landlocked country that shares borders with Germany, Czech Republic, Switzerland, Liechtenstein, Slovenia, Italy, Hungary and Slovakia. 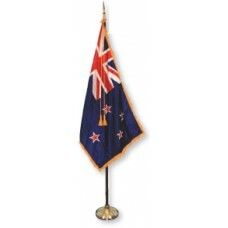 The flag was originally a naval ensign until it was officially adopted in 1918 and became the national flag. However, during World War II it was banned as Austria was made part of Nazi Germany between 1938-1955. Until Austria became divided during the war and occupied by America, France, Great Britain and the Soviet Union, it was one of the most powerful countries in the world. It became officially independent on October 26th, 1955 when a treaty was signed in Vienna and the national flag was re-adopted. Austria is mainly mountainous (62% of the country is occupied by the Alps mountains) and is very famous and renowned for its scenery, its villages and the historic cities which are home to some of the oldest buildings in the world, including "Haslauer" which is the world's oldest inn and restaurant that is still in business, and the oldest Zoological garden, "TiergartenSchonbrunn," which was settled in Vienna, in 1752. Over 700 animal species live here and it is recognized as the premier zoo in Europe. Austria relies heavily on tourism for its economy and its capital city, Vienna, is a very popular touristic attraction. Vienna has been referred to as the "city of music" since the city has been home to more renowned composers than any other city in the world, including Mozart, Haydn, Brahms, Beethoven and Schubert. The apartments that these musicians used to live in are now museums and popular tourist attractions. Another popular historic site in Vienna is the "Zentralfriedhof" which is the cemetery that contains over 2,500,000 tombs amongst which the composers are buried. As well as being referred to as the "city of music," Vienna is also known as the "city of dreams" as it was home to the world's first psychotherapist, Sigmund Freud as well as the renowned mathematician and scientist, Christian Doppler, who introduced the principle, "The Doppler Effect."